About a month ago, I agreed to join a group of bloggers who were going to regularly review new book offerings (sponsored by http://www.theooze.com). Not only was I honored to do this but also, since I love reading, I thought it would be a great idea to catch some early copies of books that were going to make the rounds eventually. Thanks to the Ooze for this opportunity and to Mike Morrell for the invitation. The first book I dove into was a book considered by some to be a Christian Classic. It was written by Madame Guyon (if you know the story of this woman, you know that the name is a shorten version). If you don’t know anything about her, I would check out Wikipedia or Google her name and check out her life’s story. Quickly, she is a woman who grew up and lived during the time of the rise of Post-Reformation Scholasticism…during the mid-17th and 18th centuries where the Church was systematizing its faith and doctrine in a manner that only rivaled that of the early Nicene days. 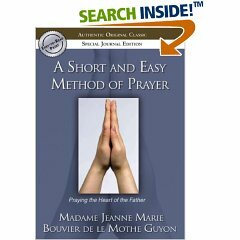 Madame Guyon’s life is a stark contrast (best referred to as a juxtaposition) between that of scholasticism and a “mystical” experience of God. “…peruse this little treatise with a humble, sincere, and candid spirit, and not with an inclination to cavil and criticize, and you will not fail to reap some degree of profit from it. It was written with a hearty desire that you might wholly devoted yourself to God: receive it, then, with a like desire for your own perfection (i.e. transformation in her language); for nothing more is intended by it than to invite the simple and child-like to approach their Father, who delights in the humble confidence of His children, and is grieved at the smallest instance of their diffidence or disgust” (p. 11). I believe one thing – you cannot read something like that and say that she is being overly simplistic or formulaic (an oft seen experience in much of contemporary expressions of faith) about the issue of relationship and prayer. In addition, this entire treatise is written with such humility that it is hard not to want to actually appreciate more this woman’s encouragement. There is nothing that invites me more into a person’s journey than a heart of humility. That is the spirit that is consistently experienced in this book. So, what is it about? It concerns transformation, humility, and various expressions of prayer that give credence to a devoted life to God. It is focused on various “degrees” of prayer ranging from meditative, to rest and prayers of intercession. This is not a simple prayer book…it is one that challenges the intimacy of the reader’s relationship with God and begs us to answer the question, “how seriously and sincerely do you desire to be ‘one’ with God?”. In addition, each section in this printing has a place to journal through the book…that could be a great help to many who like to make notes and/or share with other people what this book has meant to you. I was caught up in this book…it is not an “A.C.T.S.” methodology and it is not a “name it and claim it” approach. It is a summary of one woman’s experience of journeying into the heart of God. Prayer is a tough part of many Christ-followers experience in faith…this book could give you some much needed perspective on defining for you what it means to be devoted to God. Check it out by clicking here. ← I commend to you Jim Palmer’s newest blog entry!